Sign up with your email address to receive news and updates on Dallas. 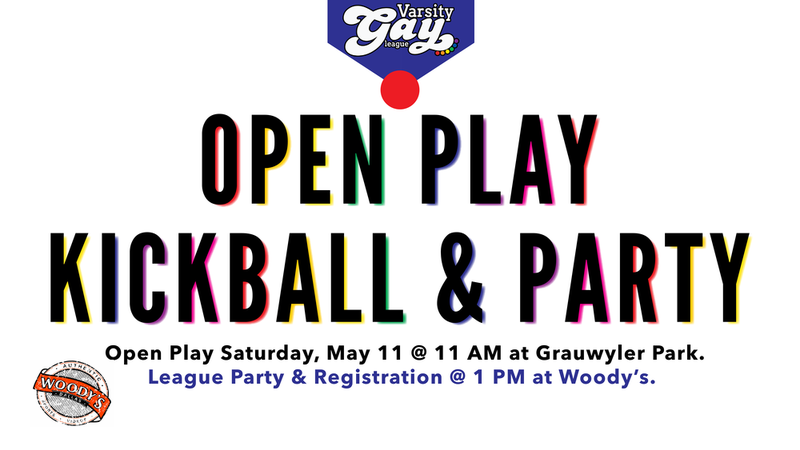 Come Join Varsity Gay League for a FREE Kickball Open Play and Scrimmage! Never played kickball before? Want to make some friends and play outside? Want to get great support from an experienced staff? Logan and Jeffrey are ready to welcome you to the fun and exciting world of kickball! 11:15am - Warm Ups, Skill Drills and Getting used to the game. 12pm - Play an actual game. 1pm - Join us at Woodys for a registration party with drink discounts, bar games, and more!!! Anyone is welcome regardless of experience. Gay or Straight. If you're not athletic, that's OK. Come have fun!! If you want to bring friends, no they don't have to RSVP! Bring comfortable clothes and cleats if you have them. No metal cleats, however. Gym shoes are fine as well. Bring some water as well to stay hydrated! Come with an open mind! Our official Kickball League will be starting May 18th, so if you enjoy yourself, we encourage you to sign up. If you just want to sign up now and still attend the scrimmage, by all means, come and join!! Varsity Gay League formed the first LGBTQ+ Kickball League in 2010. Since then we played with 16000+ players in 15 cities across the USA! Unlike other leagues, we focus on providing value, creativity, and a supportive staff focused on helping you succeed. Our league rules are recognized nationally in the largest tournament's in the world, and are focused on game play, competition, but also, fun!